I call Walter Sea at Camper & Nicholsons about the sale of the 45m motor yacht Marco Polo and he confirms he acted for the buyer with Josh Gulbranson at Fraser Yachts representing the seller. She's a high-quality, long-range explorer yacht designed by the UK's Ron Holland and built in Hong Kong by Cheoy Lee in 2007 to Lloyds class and MCA compliant. With a distinctive green steel hull, this superyacht has a GRP superstructure and accommodates nine guests in a master, VIP, double, twin and single cabins. Two independent Caterpillar propulsion packages give a range of 6,000 nautical miles at 10 knots. 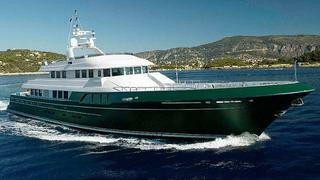 Marco Polo won the 2008 ShowBoats International Design Award in the 40m+ class and was asking $19.5 million. Walter tells me she'll now be renamed Dorothea III.